Riker really does seem to be the kind of guy who's phaser someone in the face. Would have really spoken to his character. Mark wrote: Didn't Europe edit Remmicks head exploding scene before it aired???? They did. I watched the ep a fair few times before catching the undedited episode. Came as a bit of a shock really. Still, the douchebag had it coming. 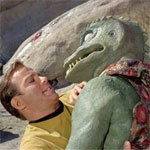 Tyyr wrote: Riker really does seem to be the kind of guy who's phaser someone in the face. Would have really spoken to his character. Well, given that a headshot shouldn't be all that more effective against your standard target, you'd have thought a midbody shot would be best. kostmayer wrote: They did. I watched the ep a fair few times before catching the undedited episode. Came as a bit of a shock really. Still, the douchebag had it coming. Only the UK edited it, AFAIK. They also edited out a bit of another episode where Picard comments that the IRA's terrorism resulted in Northern Ireland being handed over to the Republic. Sionnach Glic wrote: They also edited out a bit of another episode where Picard comments that the IRA's terrorism resulted in Northern Ireland being handed over to the Republic. Was that "The High Ground"? I seem to remember that episode being banned altogether over here for a time. Yeah, that's the episode. I didn't know they banned it though, I just thought they edited out the line in question. They did. It was only brief; Data listing successes of terrorism referred to "the Irish reunification of..." some year in the 2020s. Funnily enough, it turned out to be a case of terrorism being defeated instead. Well, I'm almost done with season one, and all I can say is "Damn Son." The characters all seemed forced in the first few episodes, but they seem to be meshing. I was just about to start the ep where B-4 appears when I called it a night. I dug the foreshadowing of the shadows. (no pun intended) The only one I still don't feel is Ivaniva. Sinclair has become a viable character for me, and I've always liked Garabaldi. Even Londo grew on me. The only other one I'm still "Meh" about is J'Kar. The Narn don't impress me much yet. Mark wrote: Well, I'm almost done with season one, and all I can say is "Damn Son." Also, before you watch season 3, make sure to watch the movie "In the Beginning". Seriously, G'Kar becomes probably the best character of the lot IMO later. Don't let his appearance now fool you. So, Babylon 4 was "stolen" through time. I'm really "meh" about that concept. Especially once you realize who "the one" is who stole it. BTW, what is a Babylon class stations weapon complement? Mark wrote: ...BTW, what is a Babylon class stations weapon complement? B5 itself seems to be only moderately armed compared to Earth Alliance Omega-class Destroyers, but B4 was supposed to be a lot bigger and tougher. As for specifics, this is about all I could find. If they presumed B4 destroyed, why would they build a weaker station for B5? Seems strange to me. Mark wrote: If they presumed B4 destroyed, why would they build a weaker station for B5? Seems strange to me. They pretty much blew everything they had on B4; they barely managed the political support to fund B5 at all. Thus the "Last hope for peace" line. Remember, Babylon 5 humans still have a money-based economy.